Humour has defined the life of Byron Otieno commonly known as Owago Onyiro to lovers of Churchill Show on NTV. 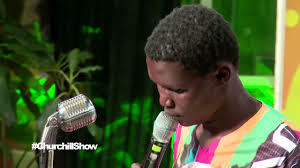 From the time he was as a student at Kanyawanga High School in Rongo where he sat for his national examination in 2003, Onyiro has been a comedian who entertained his classmates and teachers. In an interview with Migori News the comedian who also doubles as an emcee said that a major misconception about him is that he always come across as a comedian even in serious issues. “People don’t take me seriously as I come across as a joker even when I’m serious,” he said. During his high school days, Onyiro said Physics was his best subject and wished to be a lecturer in an Engineering department in a top college before his passion and talent as a comedian saw him change the course of his career. He got his education at Railways Training Institute before finishing at Kenya Polytechnic University. To be able to record for the Churchill Show which is done every Thursday at Carnivore Grounds in Nairobi Onyiro said they have to be on rehearsals between 10-12:00pm on Tuesdays and Wednesday from 2-5pm. “On Thursday we often arrive at the grounds at 10am for final rehearsals before we shot both Churchill Show and Churchill Raw Shows aired on NTV from 6pm to almost midnight,” he said. Afterwards he sleeps until Midday the following and prepares for a gig as an emcee. “I’m very good at entertaining people as it’s the only way I can be myself, avoid shortcuts in life and follow my talent to success,” he said. Hailing from Uriri Sub County just next to the DC’s office has come out as a top entertainer in Churchill Show and received many fans across nationally. “When I have shows in Central area I’m overwhelmed by the support which also cuts across his social media platforms,” he said. The comedian encourages youths from Migori County to always follow in their talent and look for hobbies that capture their talents. “Talents is a major way in face what we wish to become in life,” he said. He said education is the pillar and youths should strive to complete their course and never be discouraged by employment prospects. “Getting an education is a step in life which pushes you to next level to make it easier to cope with life,” he advised. Keep up .you make me know all about my county gud job.